← Why Can’t I Stand Up Like My Brothers? Surgery is not necessarily something we look forward to, especially when our children have to undergo it. However, we have been battling ear infections, repeated ear drum ruptures (twice within one month), and a tube stuck in an ear canal for at least six months. We are ready to start again on a “clean” slate. 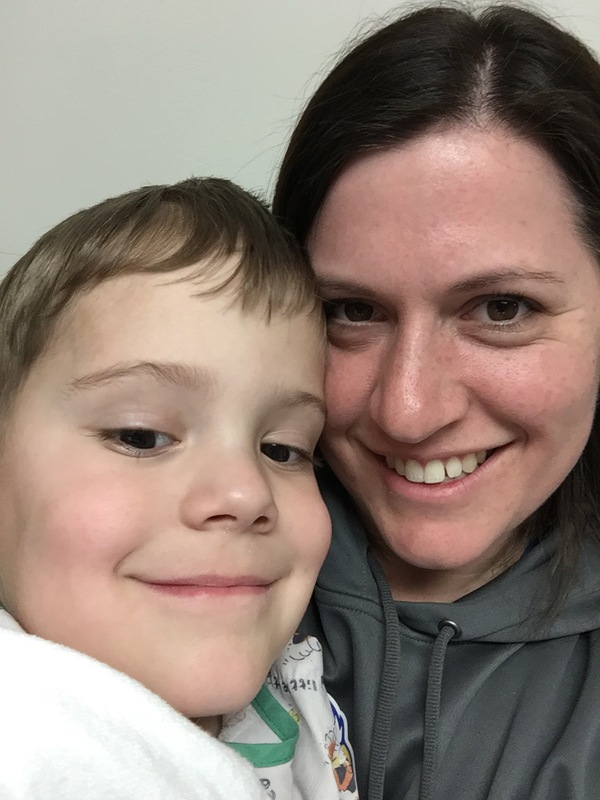 Colten had bilateral ear tubes put in when he was about two and a half years old. They worked great. His ear fluid is very thick – the doctor at the time described it as “wet cement”. So he would get fluid, infections, and fluid would never clear. Then he would get more infections. Repeat repeat. Tubes changed that and were great for him! However, ear tubes are temporary (I did not know this!) and fall out on their own within six months to two years. Usually. Unless you’re Colten and you simply like to defy the odds. A while back we started to see dried blood every so often in Colten’s ears. We have an otoscope at home – that thing doctors use to look in ears, noses, and throats. With four kids, it’s helpful to know if a cranky child’s mood is from ear infections or just them being cranky. Saves us on unnecessary doctor visits! Anyhow, we could see some dried blood in his ear. At first we didn’t think much of it, but it repeatedly seemed to creep up, and sometimes he would complain of ear pain, but usually only one time in a rare while, then nothing for days or weeks. When looking in one time, we realized that his one tube was stuck in the ear canal, embedded in a chunk of wax. SERIOUSLY?! It is possible the tube was scraping in his ear canal somehow, causing the pain, scratching and bleeding, but we don’t know. Of course, when we called the ENT and said, “We think one of his tubes is stuck in his ear canal”, the medical assistant relayed that “that is not likely.” Yeah, he’ll show you. Sure enough, we went to see the ENT for his next ear infection so we could have him re-evaluated. And what did he find in the ear canal? A tube. Stuck in wax. It was lodged so close to the ear drum though, the ENT did not want to extract it without anesthesia. So we had to leave it alone. Colten then made sure his ears proved themselves, and continued to get infections and fluid that wouldn’t go away. Then his ear drum ruptured. Twice. In one month. Within days of finishing the antibiotic for the first rupture and infection, it ruptured again. At this point, we already had surgery scheduled and thankfully, the rupturing did not deter that from happening. The ear drum heals itself quickly! So here we are today for surgery #7. We are not at our typical children’s hospital. We are at one of the surgical centers this ENT works out of. There are definite advantages to using a children’s hospital for our other procedures, especially when a child needs anesthesia. Here at McLaren Macomb, Colten and I had to part ways at the door before anesthesia. The last time Colten had anesthesia at our children’s hospital, I was in the hospital bed with him until he was OUT. He gets a lot of anxiety with medical stuff (can’t blame him) and he kept telling me yesterday and today, “I don’t want to go to sleep. I don’t like the mask. It hurts my throat after.” Nothing like tugging at my heart strings! Even though he gets Valium/Versed ahead of time to help calm him, it does not appear to do enough. He used to get very loopy with it when he was younger, but not as much anymore it seems. Back to the surgery. The doctor already came out and gave me the post-op consultation. 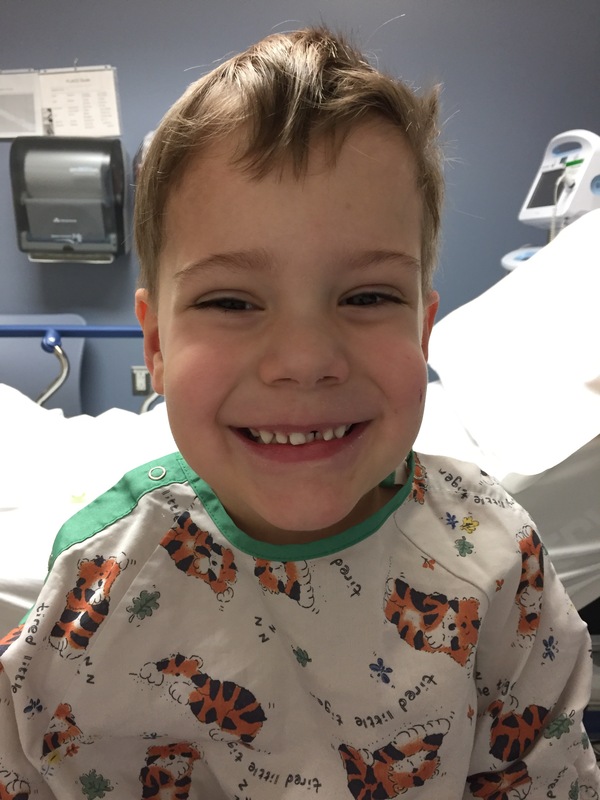 They extracted the embedded tube from the right ear, put in new tubes in both ears, and removed his adenoids, which were very large and infected. Adenoids can get in the way of the eustachian tube draining properly, so we are hopeful that their removal, plus this set of tubes, might get him on the pathway to better ears, and that once these fall out (and hopefully don’t get stuck), that maybe he will not have more recurring issues. 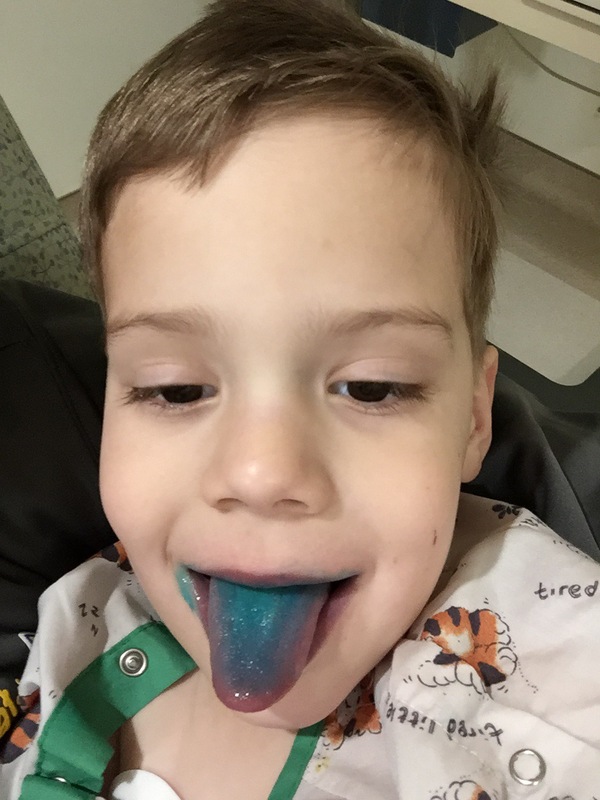 Now I am back in recovery with him, then we’ll head home for ice cream and popsicles all day. And with his dad and brothers all off school due to these vicious winds and resulting power outages, we might just have a lazy day of popsicles and Netflix with the kids! Thankfully, our power is going strong. Hope all of you without power get it restored soon. Stay safe! This entry was tagged anesthesia, ears, ENT, Surgery. Bookmark the permalink. I smile every time you post pictures of Colten, even the blue tongue. I’m amazed with your humor and stamina Katie. You and Richard are quite the team. But look at the players…..
My goodness you are all amazingly resilient. Hugs and love to all and Colten get well real soon. Colten sure is a brave little soldier.. I pray this last surg does remove his painful ear problems for good. God Bless you Little Blue Smurf! Get well fast..
Love you Kate! What a beautiful boy.